Majorca (or Mallorca), in Spain, is the largest of the Balearic Islands and is the most popular of the Mediterranean Islands. This tourist mecca boasts beautiful beaches, breathtaking mountainous views and a rich cultural history. The summers are infamously swelled with an amazingly diverse crowd who want to spend their holidays to Majorca: celebrities, food enthusiasts, and countless European tourists. Once they arrive, visitors are greeted with quaint medieval villages, top-notch food and wine, and a hypnotizing ancient landscape. Port d'Alcudia - on the North Coast of Mallorca, 52km north of the capital Palma, lies the lovely resort of Port d'Alcudia. The bay has lovely warm water and the longest beach in Mallorca. The original town of Alcudia is 3 kms inland and is well worth a visit. Fronted by colonnades and glass facades, the Palace de Muro is a grandiose spa resort located on the beachfront of Playa de Muro, on the island of Mallorca. Guests can enjoy a buffet breakfast each morning, and Spanish specialties and international dishes are served in the relaxed atmosphere of the restaurant. The Palace de Muro's leisure facilities include outdoor pools, saunas, thermal showers, ice booths, Turkish baths, solarium, gymnasium, jetted tubs and a squash court. The indoor heated pool is decorated in classical roman style. Guests can enjoy a drink at the poolside bar, order up room service, and make use of the laundry and hair and beauty salon. Golfers can take advantage of the golf storage room and information desk. The hotel leads directly onto the beach and the marina is only 500 meters away, while the dramatic cliffs of Mirador des Colomer (10 kilometers away) provide a perfect day-trip for nature enthusiasts. The large, modern Hotel Playa Esperanza is surrounded by palm and pine trees and set on the beach on Majorca's northern coast, 200 metres from the S'Albufera Nature Park. Guests can choose between the snack bar by the pool, and the Playa Esperanza Restaurant with its sea views, or enjoy a cocktail in the bar, overlooking the garden. 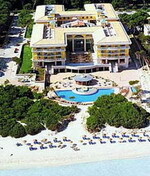 Alternatively, guests can take advantage of 24-hour room service. The property features a recently opened wellness and spa centre with sauna, steam room and massage treatment room, as well as a diving and windsurf school. Mountain bikes are for hire, and guests can work up a sweat in the fitness room or on the tennis courts. There is a large outdoor swimming pool, and a heated indoor pool in winter. 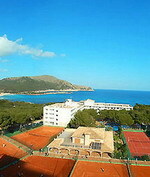 The Pollentia Club Resort Maris is located in Puerto de Pollensa, Mallorca, Spain, 2.5 kilometres from the resort town of Alcudia, 36 kilometres from the Coves d'Arta, and 70 kilometres from Palma. 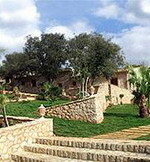 The resort's buildings are built from local sandstone and set in gardens with a landscaped swimming pool complex. The health club has saunas, a gym, and beauty and massage treatments, and the resort has three shops including a mini-market and a gift shop selling Balearic art. 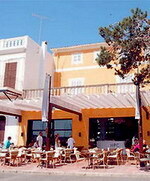 The Pollentia Club Resort Maris has three restaurants. Denario and Ancora both offer breakfast and dinner buffets, while Restaurante Grill Aquarius, located near the swimming pool, serves a la carte dishes for lunch only. A complimentary breakfast is served every morning and the hotel also has three bars, including Millennium, which has live music. Windsurfing, water skiing, and scuba diving are available on site, and canoes and kayaks can be hired from the resort. Cala Millor - Cala Millor and Cala Bona offer some of the finest beaches in Mallorca, and after you have finished your hard day's sunbathing there is a host of activities in the town to keep you occupied in the evening, along with some of the finest restaurants in the area. Cala Millor is on the island's rugged east coast, and is separated from its more quiet and traditional neighbour Cala Bona by a small rocky headland. This five star hotel on the East coast of Majorca is located in the village of Sa Coma, about 40 minutes from the international airport of Palma de Majorca. The hotel offers the fully equipped and modern Biomar Spa which offers within the installations relaxing treatments, programmes and sea water circuits, a fantastic leisure facility, Club Protur Sa Coma Resort and five à la carte restaurants with exquisite cuisine, from local to international. The hotel offers luxurious installations with 216 rooms all thought out and designed having our customer’s holiday in mind. 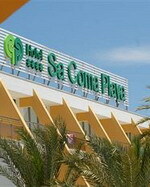 the Protur Palmeras Playa Aparthotel is located just 100 metres from the Sa Coma beach, one kilometre from central Cala Millor. This hotel has 236 air-conditioned guestrooms with neutral decor and light wood furniture. All include balconies, kitchenettes, satellite television and telephones. Guests can swim in the outdoor pool and enjoy a drink or snack from the poolside bar. Younger guests can enjoy organised children's activities and guests of all ages can take advantage of the sports club, which incorporates 18 tennis courts, racquetball courts and a driving range as well as a gym and sauna. There is a television in the lobby lounge and guests can check their emails at the Internet point and visit the hair salon. The buffet restaurant serves Spanish and International cuisine and drinks and cocktails are available at the bar. 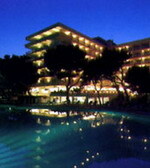 Cala Ratjada - situated in northeast Mallorca. Small fishing port in an unspoilt area of the island with endless golden beaches. Hotel Canyamel Park is located on the eastern coast of Park de Llevant in Mallorca and only 50m away from Canyamel Beach, an incomparable place to enjoy your holidays. This white Mediterranean-style resort is surrounded by pine trees and is situated 50 meters from the beach in Levante Park on the eastern coast of Mallorca. The 132 guestrooms feature a simple blue and white décor with light wood furnishings, and balcony or terrace with views of the sea, mountains, hotel gardens or nearby village. Each room has a work desk with internet connection, cable television and telephone. All bathrooms have handheld showers. Apartments also have separate living area with kitchens. The Hotel L'illot Park is a modern hotel set within 4000 square meters of gardens in the resort of Cala Ratjada, 700 meters from Cala Agulla beach. The hotel boasts an extensive range of spa facilities including a hydrotherapy circuit and bubble-operated levitation bench. Those feeling energetic can enjoy a game of tennis on one of four ash courts or play a round of miniature golf. 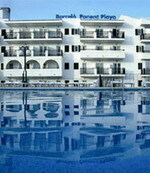 The hotel offers indoor and outdoor pools, as well as a separate pool designed for children. Guests can while away the hours lounging on the sun terraces or sip a cocktail under the shade of the poolside bar. A shuttle service runs between the hotel and the nearby beach during the summer months. The Illot Park Restaurant serves a daily buffet selection of international dishes every night and there is also a hotel bar and café, which offers drinks, cocktails and snacks. With an extraordinary situation between a forest of pines and the great natural beach of Agulla Cove in Ratjada Cove, the Hotel & Spa S' Entrador Playa, 4* Superior, totally renewed in 2004, not only offers well-being and beautiful views, but also a family atmosphere with all the qualities of the Mediterranean. The ultramodern complex of health and beauty, Oasis & Spa, offers a conditioned and invigorating swimming pool with aquatic massage beds; toning swimming pool, salt water jacuzzi, sauna, Roman baths, Turkish bath with cromotherapy, revitalising Cuba ice, thermal showers, 2 state-of-the-art gymnasiums, solarium, hairdressing salon and a beauty parlor for corporal and face treatments.